This beautiful work is a detective story, of sorts, that examines the death of artist Vincent van Gogh. What if his paintings, with their wild colours and vibrant brush strokes, had been able to move? And what if the bullet that killed him had been fired by someone else? A seven-year arduous labour of love by Dorota Kobiela and Hugh Welchman, the film turns van Gogh’s work into an unusual kind of biopic. Using tens of thousands of oil paintings commissioned from scores of artists, the filmmakers transform famous works of modern art into a hypnotic and beguiling cartoon. The people van Gogh rendered on canvas — the provincial French functionaries, doctors, barmaids and farmers immortalized on museum walls — are brought to uncanny life, with the voices of professional actors, some of them well known. They participate in a meandering detective story. Armand Roulin (Douglas Booth), the lay-about son of a village postmaster (Chris O’Dowd), is instructed by his father to deliver a letter to Vincent’s brother Theo. Armand travels to Paris and then to Auvers-sur-Oise, the northern French town where Vincent died, leaving behind contradictory memories among the people he painted in his final years. They recall a passionate, hard-working artist, but not always the tormented, suicidal genius of legend. That legend has been sustained by earlier movies, notably Vincente Minnelli’s rumbustious Lust for Life (with Kirk Douglas as van Gogh) and Robert Altman’s more cerebral Vincent & Theo (starring Tim Roth and Paul Rhys as the brothers). 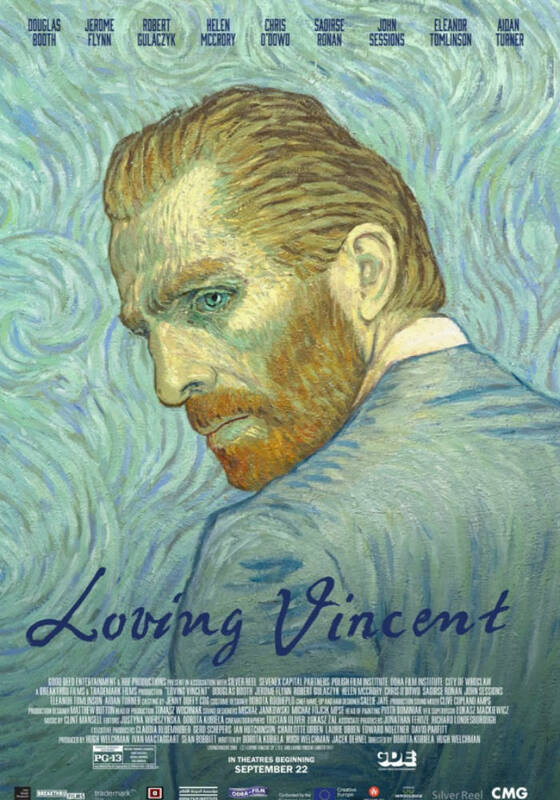 Vincent himself (Robert Gulaczyk) is a more elusive presence in Loving Vincent, since most of its action is posthumous and self-portraits make up a relatively small part of his oeuvre. There are flashbacks, but the painter is evoked mainly through the dialogue of the other characters. The principal mystery is the stuff of police procedural, as Armand doggedly tries to reconstruct van Gogh’s final weeks and shed light on the circumstances of his death. How miserable was he and why? What secrets did he harbour? What enemies had he made? The questions are interesting, but not quite sufficiently dramatized to sustain Loving Vincent for its full length. The viewer also becomes somewhat accustomed to the images, and astonishment at the film’s innovative, painstaking technique begins to fade. But its charm never quite wears off, for reasons summed up in the title.